Ingredients: Water, malt, barley flakes, Tomahawk hops, coffee and yeast. 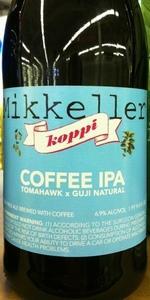 The coffee comes from Swedish coffee roasting-house Koppi. The first batch had Guji Natural organic coffee from Sidamo, Ethiopia. The second batch had Odoo Shakiso Coffee from Ethiopia. Brewed at De Proefbrouwerij, Belgium. Tap at Lager Lager Berlin. Look is a nice orangey-amber clor with tiny head. Not too much hoppyness on the nose, neither coffee or malts, just anonym aromas. Taste is coffee but not as you would expect with a stout, everything here is weirdly well balanced between hops and coffee, you love it or hate it at first sip. Feel is what i liked the most on this beer: mid/low carbonation together with that creamy bosy that calls for another sip. Overal i enjoyed this one a lot, even though i think it wasnt relly fresh so the hopy character was kinda missing but a great beer that hooks you during the session. Nice orange glow that you see with some of the better dipas out there, this looked nice, white head on it. Aroma was like, coffee? What coffee? Coffee ipa, and the coffee is entirely missing, and the hops are extremely muted? I'm sorry, this didn't smell bad, but it was totally underwhelming. Taste just was devoid of coffee as well, and hops were underdone. I mean, you gotta really warm this up to pull any coffee or CTZ hops out of it. Expensive to boot? Screw this beer. last of the keg in Mikkeller Bar and on the house. It was beer #2 and VERY early in the day so I was quite prepared to toss it if necessary. It wasn't. Not a fan of coffee beers except for some of the Whale Stouts but a big coffee and big IPA fan. This was good. Nice hops and a coffee taste without it being to coffeed (Surly Coffee bender anyone.....). If you like coffee and IPA you will enjoy this one. I prefer Mikkeller's Sleep Over Coffee IPA over this particular beer. Bottle aged. A very interesting light coffee ipa, Belgian style. I typically don't love coffee beers (especially of the stout variety), but this one was very interesting. Not like any coffee beer I've ever had. It's light, not overly hoppy and full of flavor. A dessert beer, or late night sipper (if you need to stay awake). I'll grab this one again.